StudioSeminar can guarantee this, as we cooperate with studios across Germany and throughout Europe. A concentrated space for your personal presentation or a spacious area for scene work: Our partner studios feature state-of-the-art technology with high-quality lighting systems, acoustic room adjustment, as well as blue box and green screen options. For your presentation, we will provide large monitor screens, a suitable grid connection, teleprompters (if desired), as well as a wide selection of controllers, drawing tablets, and much more. We have a wealth of experience and the required sensitivity for working with people in front of a camera. Relaxed creativity determines the atmosphere. You will feel comfortable with us. Our technology and our employees are at the disposal of the speaker and their presentation. 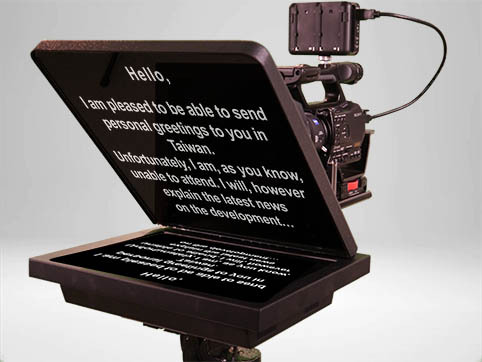 If desired, we can facilitate your presentation in front of the camera by using a teleprompter.